If you live in an area with a population of 25,000 or greater, we believe that you could have a Well rented out every weekend, and some week nights at high school events. We don't recommend renting it for more than 1 day at a time so you can get two rental payments each weekend. For instance, at a charity event of some kind on Saturday and a church on Sunday. Include a Friday night high school football game and you have three rentals per weekend! We recommend the organization renting it out get 50% of the proceeds or $250, whichever is least. That way, the renting organization can really promote it in a big way, get some matching sponsors, and do the other things that are recommended in our Event Promotions Strategies. If you could get $250 per weekend, or rent it twice and get $500, either way, you would easily be raising more money than Wells in Wal-Mart and many other great retail locations. When you order your Well, include a rim-sticker and a round sign like the one shown here. 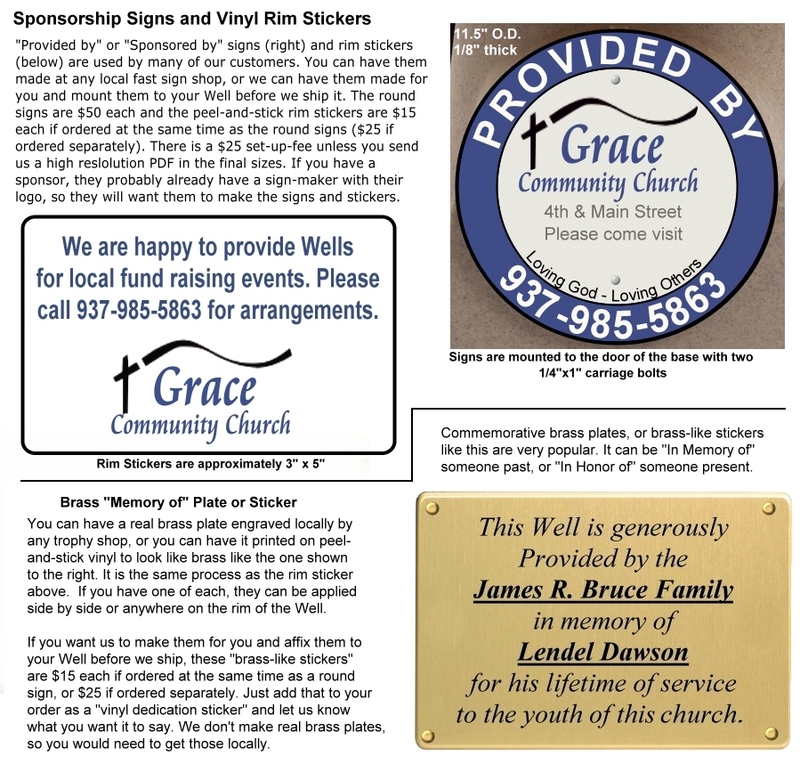 Whenever your Well is out on location, almost every person who stops and tosses coins in will see the rim sticker and sign, and that will remind them that they are connected to a charity that needs money. This might be their child's cheer-leading squad, musical instruments for band, hospital association, service club, school, church, habitat for humanity or any number of large and small organizations. The way you would kick it off is to submit a press release. It isn't necessary, but the media would love to help you get the word out. Then send out the direct offer to local churches (or find out how to tap into their local associations), to the Kiwanis Clubs, Rotarians, Lions, etc., to the school PTA's and sports directors, and any other charities you can find email addresses for. Again, you can skip this step, but why not take advantage of it to get things going! If you don't do steps 1 or 2, then just carry your Well to your local high school and show it to the athletic director or the PTA and offer it for their games or other events. You are offering it at no up-front cost to them, so of course they will take it. Hand them a copy of the promotional event ideas and say, "While it will raise quite a bit of money just being at a game or event, you can get into the thousands of dollars if you do some of the suggestions on this page." Exposure at every event will lead to more requests. When parents and grandparents are handing coins to their children, they will see the rim sticker and call your phone number. You just email the rental agreement to them. It includes the simple things they can do to promote the Well and bring in large amounts of money which will help convince them to do it. Events that only need the Well for one day have the advantage of being able to communicate with their members before the event, and that lets them promote it with the 3 or 4 things that were done by the church in California that raised over $40,000 in one day. Renters come and pick your Well up from you, bring it back, and hand you a check. You don't even have to handle the coins. Fund raising doesn't get any easier than renting out your Well. Once you get things started, every event will have many people attending who have a connection to other charities and organizations. This can easily lead to continuous rentals. In large cities and metroplexes, you can keep multiple Wells busy. We hope this is something you will consider. Our goal is to have Wells available for rent in all parts of the country so that we can refer all the rental requests that we receive. If you want to rent your Well out, be sure to let us know when you purchase your Well.